You've always wanted to try an app from a manufacturer / Custom Rom maker? But you could not install the APP's or did not have any sources? Here I have some APP's from Roms and from the listed manufacturers also works to another device. Velvet download! Almost every OEM has its own specific set of branded applications. HTC has its Sense UI and related apps and Samsung has TouchWiz, which makes running KitKat on the International Galaxy S III “impossible.” These applications can be used with other ROMs, but they requiring some work. On XDA, we call it porting and you can find many of such applications located in various forums. With PortedAPP by XDA Forum Member APP-Maker, you can now use OEM-specific applications on other devices without effort. All you need to do is run the app, select an OEM, and download your desired application, ready to install. The current list of supported apps includes those from OEMs like Samsung, Sony, and Nokia. CyanogenMod- and MIUI-specific apps are also included. Root is not required, and every application runs flawlessly on most devices. Essentially, this application a database with applications ported from other devices/ROMs. You can find out more by taking a trip over to the application thread. Part of the magic of Android is the level of choice we are presented with as users, not only on the hardware front but when it comes to software as well. Want stock or near-stock Android? Devices like the Nexus 5 give you that option, as do custom ROMs and a few other branded handsets. For those that want Samsung’s additions, there’s the Galaxy family with its TouchWiz-laden ROM. The list goes on, but you probably get the idea. For those that are interested in some of the OEM-specific apps and features but not so interested in picking up their hardware, you might want to take a look at PortedAPP, a new app from XDA forum member APP-Maker. Basically this app is a collection of APKs that give you access to special apps from Samsung, Sony, Nokia, MIUI and even CyanogenMod. Now it’s important to note that not every app is ported, and the number of existing apps is currently limited. 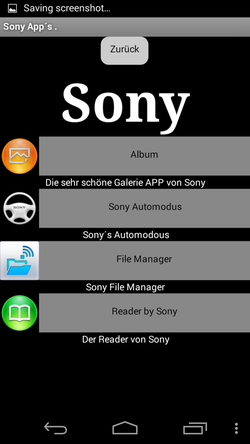 As an example, under Nokia you’ll find the Store app and under Sony you’ll find the Gallery, Sony’s Car mode, Sony’s File Manager and the Sony Reader. Samsung apps include the Galaxy Launcher, S Baro, Samsung’s alarm app, and S Voice. To learn more about PortedAPP you’ll want to head on over to XDA’s website. You’ll also need to enable 3rd party app sources to download the PortedApp APK. For those that are wary of running apps found outside of Google Play, the app seems to very much be legit based on our time with it, but as always, you’ll probably want to proceed with caution and at your own risk.